Maybe it is because I am back in Indonesia, trying to communicate in 3 different languages, or maybe it is because my kids have been on school holidays for 11 weeks, but I am finding it seriously hard to write anything that is comprehensible. So I will just show you some photos! First up a scrappy baby quilt top, made entirely from my 'scraps box'. I actually love how it has turned out and am linking it up with 'The Purge' at Stitched in Color. I think I will make some more like this to get through my scraps! I have also made a couple of cushion covers. One for a friend, from gorgeous Japanese vintage style fabrics, and a rainbow one for me. I have found it hard to express my emotions recently, especially over the many horrific and tragic events being reported on the news. When I made the rainbow cushion I was trying to express my belief that even though we grieve now in the midst of so much darkness and tragedy, there is always hope. There are glimpses of mercy shining through, like sunshine shining through the clouds and the storms. And every now and then we see a rainbow. This cushion now sits in my sewing room as a visual reminder to me of this. 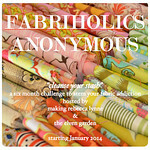 Linking up with Sew Cute Tuesday, The Slow Bloggers Linky and The Purge. 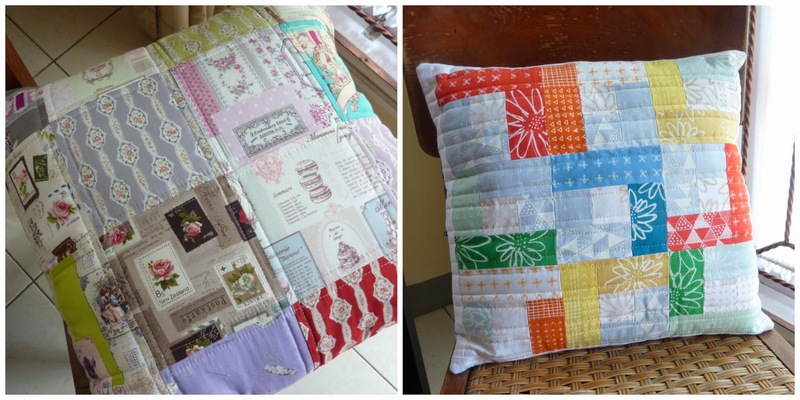 Love the scrappy quilt and the cushion covers. I'm trying to make a dent to my scrap bin and started using them too. I share your sentiments about all the negative stuff that is going on around us, but the important thing is to remain positive. Your cushion cover is a great reminder. Each of your finishes is beautiful. Making something with a special meaning behind it is very satisfying, being a wonderful visual reminder. Lovely makes, Deborah, we all need rainbows in our lives. All three of your projects are so pretty. The rainbow is happy and colorful. The news has been so grim recently. Your colourful cushions and quilt are very cheering. The rainbow cushion looks great, and what a beautiful meaning behind it. Brilliant use of your scraps Deborah. Your cushions are lovely too, your rainbow cushion is an ideal way to lift the spirits when everything seems dark and depressing. with your sewing and quilting you have made order out of choas. let that mantra help you find stability in this crazy world. Great colors and designs - thanks for sharing!! Seems very articulate to me, both with words and creative expression in fabric! Especially like the rainbow cushion. You have some very nice scraps! 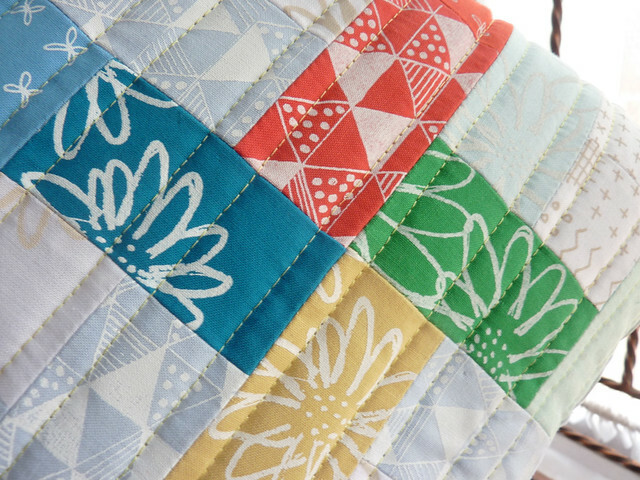 Yay for scrappy happy quilts and love the cusions - especially the rainbow one! I saw your quilt linked up on Stitched with Color. It caught my eye immediately from the others as I was scrolling down! My scraps are bogging me down and I've been trying to use them up too. A scrappy pillow cover is a great idea! When do your kids go back to school? Mine started today and it was bittersweet. Quiet at home with only one here with me. Sometimes it helps to remember that the good news rarely gets reported as it is not 'news'. These cheery cushions and quilts are sure to help inspire good moods. I am glad that you found a way to focus on hope through something beautiful and useful you made. How healing. Thanks for sharing! Love all these projects! Your cushion is beautiful. I so agree with you about the need for optimism at the moment. Keep on making beautiful things - your scrappy quilt and cushions are lovely. Your scrappy top is great! I didn't realise it was made up of scraps until I read that; the fabrics together look like they all belong in a collection! Your photos were beautiful, love all those makes, but your words were very meaningful too, personally I think your writing was spot on there. love the thoughts behind the rainbow cushion! what a great tangible reminder. hugs for the hard days! 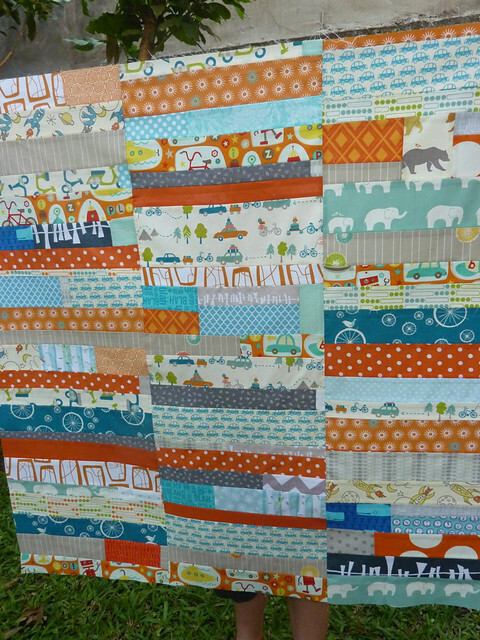 ps - LOVE your scrappy baby quilt! with all the baby quilts i have to make all the time, i'll keep this one in mind.